Take it from day to night in a cute wrap dress like the Heart Print Frill Wrap Look Dress. 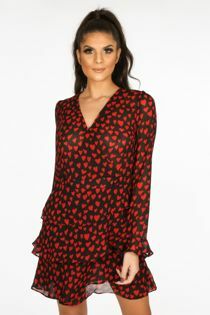 It features long sleeves, a layered frill hem and is finished off with a heart print which adds a feminine touch. This is the perfect piece for afternoon drinks with the girls, style it up with a mini black tote bag and barely there heels.